In 1982 a young, ambitious East Texas entrepreneur, whose business is growing at doubledigit rates, decides there must be more to life. So, oddly enough, he writes a letter to the man whose books he most treasures&mdash;Peter F. Drucker, father of modern management theory and practice. 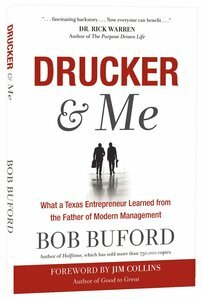 As they met over the years, Buford sees that &ldquo;Drucker is to management what Shakespeare is to literature.&rdquo; Their relationship progresses from paid consultant to mentor to close friend. Drucker &amp; Me tells how two men discover a mutual passion and strategy that will literally change the world. Their disappointment with corporate America leads them to embrace the non-profit sector, including one of the most important developments in the last 30 years&mdash;the mega church movement. Believing non-profit organizations change lives, they begin work with Rick Warren, Bill Hybels and others to design a new management model for non-profits in the 21st century. Bob Buford is a graduate of the University of Texas and the Owner/President Management Program at Harvard Business School. Until the sale of his company in July 1999 Bob Buford served as Chairman and CEO of Buford Television, Inc., which began with a single ABC affiliate in Tyler, Texas, and grew into a network of cable systems across the country. In 1995 Buford wrote the 750,000+-copy bestseller Halftime, a book about how to deal with the second half of our lives. In 2004 he wrote Finishing Well, a compilation of inspiring interviews threaded with Buford's own experiences. In 1984 he founded Leadership Network (www.leadnet.org) to serve leaders of innovative churches as they enter the 21st century. In 1998, Bob launched Halftime (www.halftime.org), an initiative of Leadership Network that helps successful people to convert their faith into action and effective results. Shortly after Peter Drucker's death in 2005, Bob spreadheaded the efforts to launch The Drucker Institute (www.druckerinstitute.com).